As the orca whale J35 continues a sixth day of mourning for her lost calf, researchers fear a second member of the southern-resident clan is wasting away and could die. 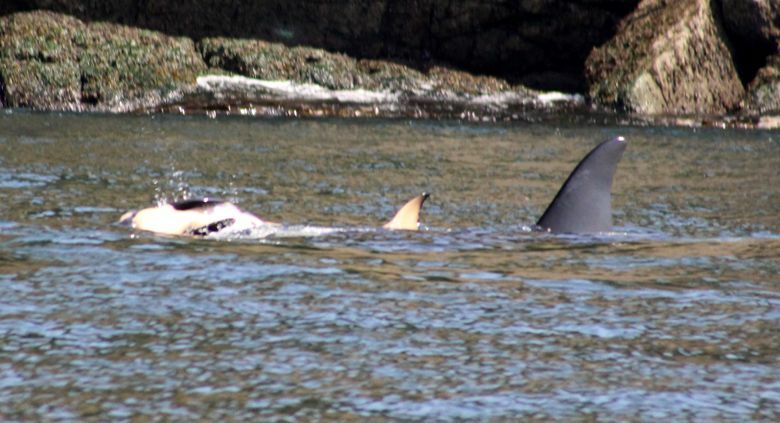 SAN JUAN ISLANDS — She carries it delicately, carefully, by the fin, or on her head, so as not to make a mark on the tiny body of her calf that lived only half an hour. J35, a mother orca in the southern-resident clan, was being closely followed as she swam by all the members of her family Sunday, as she continued her mourning ritual for a sixth straight day, swimming more than 40 miles south from Canadian waters overnight Saturday to the west side of San Juan Island on Sunday. She and her family are constantly on the move — and usually a sight that brings joy wherever they go. But not this summer. As J35’s family moves through the water they are a like a funeral procession, the mother with her deceased calf balanced on her head, and family following closely with her. Whether she is eating is not known; her family snagged a salmon Sunday afternoon and were sharing it, though it was impossible to tell from a distance who got a piece. And even as the mother whale’s grief is displayed day after day, researchers are worried about another family member, J-50, they fear will be next. Researchers are arriving this week to film both whales with a drone. With J-50, a youngster at the age of 4, the goal is to compare her body condition with earlier sightings. But others who are with the orca whales nearly every day already know, and fear the worst. 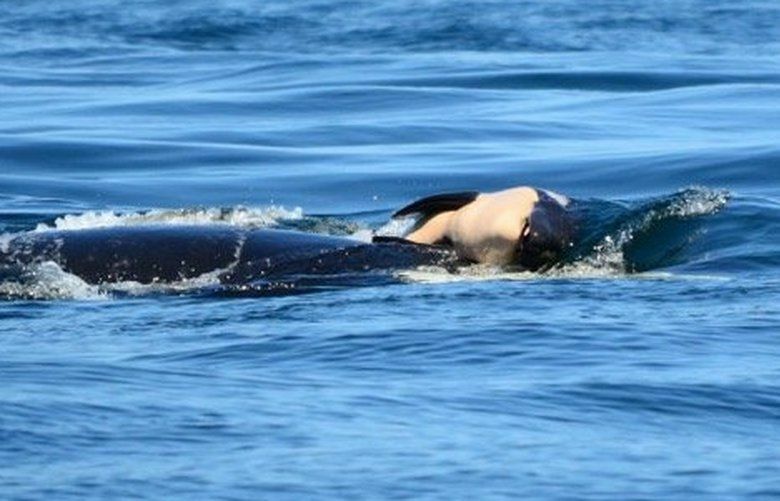 “I don’t see how she can survive,” said Dave Ellifrit of the Center for Whale Research, based in Friday Harbor. “She has classic peanut head,” he said, referring to the hollowed- out shape of her head behind her cranium, where the fat has wasted away, a known sign of emaciation. The summer of sadness unfolding for the southern- resident clan has the region on edge as a governor’s task force debates just what to do. A signature of Washington state as surely as the chinook salmon they depend on, the decline of the southern-resident orca whales is sharply felt. That is especially vivid as, right alongside the struggling southern residents, so-called transient, or Bigg’s killer whales thrive, growing in population, birthing babies, and looking fat and sleek. Those orcas eat seals — and there are plenty around to fatten on. The southern residents are fish eaters and in summer primarily want chinook. Their dependence on the dwindling chinook runs of Puget Sound as well as the Fraser and Columbia and Snake rivers is forcing them into a death spiral, with only 75 whales remaining. There has not been a successful pregnancy in the J, K and L pods of southern residents in three years. The decline of J-50 is hitting those who follow the whales hard because she brought so much hope. In a population with so few breeding females, she represented the future. Until now. With J50 on a death watch and J35 still displaying her loss in home waters that for thousands of years sustained these whales, the region has reached a crossroads with two signature species — killer whales and chinook salmon.